Please be considerate of the neighborhood when parking, taking care not to block driveways. There is a school parking lot which is very close to the property and can be used for overflow parking if needed. The school is located on Bonniewood Drive, which is the street just to the southeast of the property. Once you arrive, you can enter the property through the West side wooden gateway. Go through one more stoplight and start looking for 3800 S on your right, it's about a block and a half south of the last stoplight. Turn right onto 3800 South and come down about 2.5 blocks, we are on the right hand side (north side) of the street. 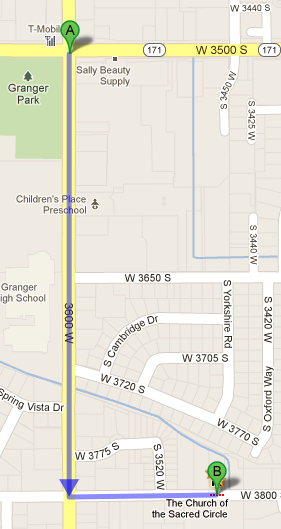 We are just 1 mile from the main West Valley Central TRAX Station. Take the Green Line Southbound from either downtown or from the 2100 South Central Pointe Station. The Green Line runs from 10 am-10pm on Sundays and from 5:30 am - 11:30 pm all other days. If you want to make your walk even shorter, you can catch either the 232 or 41 bus which go southbound on 3200 West, getting off at the stop just north of 3800 South. We are then a short 2.5 blocks west on 3800 South. Please note that the 232 route does NOT run on Sundays, but the 41 still does. The main 3500 South MAX line runs East/West on 3500 South. The 3600 West stop is the closest one to the Temple. From the stop, go south on 3600 West down to 3800 South. Turn left onto 3800 South and we are about 1.5 blocks East. We are Bike Friendly! However you get to us, you are welcome to park your bike in a safe off-street and private area near the Temple!